Forced-traffic solar systems have been designed and developed for installations with high water heating requirements (residential complexes, hospitals, sports facilities, hotel units, etc.) but also for domestic use, where the storage tank can not placed over the collector for aesthetic or static reasons. The production of solar circulation systems is carried out in state-of-the-art factory units equipped with robotic technology. Differential thermostat automation controls continuously the temperature difference between the solar panels and the boiler and gives the relevant commands to ensure the continuous hot water supply according to the circuit settings. The differential thermostat is electronically programmed to control the differential temperature and has communication keys and a display that displays the parameters and messages. Anti-freeze protection for the closed circuit. Overcurrent protection of the closed circuit. 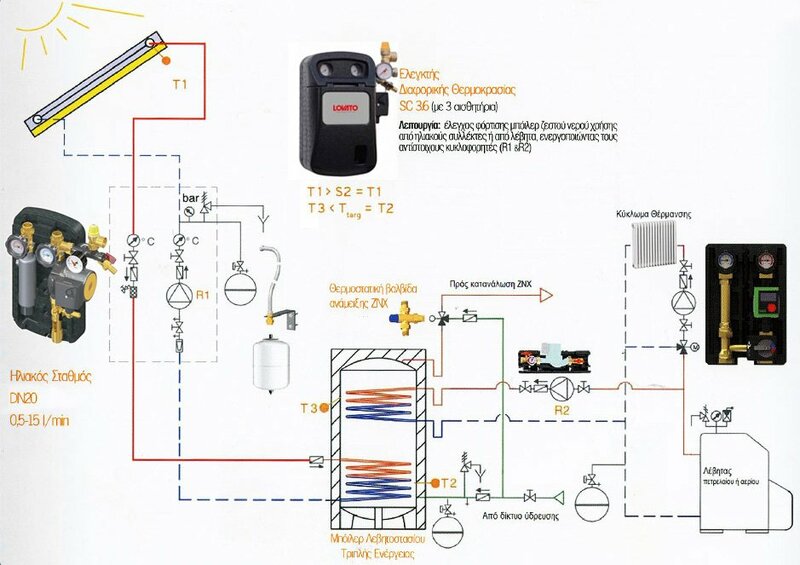 In case of insufficient solar radiation, an auxiliary power source for oil or gas boiler may be commissioned. Collector base for flat roof. Electrical resistance of 4kw and thermostat. Plugs, crosses, cups and all the necessary components for the solar collector array. MasterSOL boiler room boilers are internally protected from direct corrosion by 400 ° micron (900 ° C) direct glass fluff, with inorganic silicate mixture without chemical additives (DIN 4753 Teil 3 & 6), for absolute healthy water and exceptional durability. The range is from 150 liters to 9000 liters, with various collector surface combinations, depending on the needs of each application. - Also boilers can be either vertically or horizontal , Enamelled or Inox 316L . - The collectors can be either classic selective or crafted pressers. The company has a quality management system ISO 9001: 2008 for production and trading of solar & electric water heaters.